Sorry I've been MIA all this week. It has been a really rough week for me and I just closed up. Drama started on Christmas Day and continued in a bad streak all week. Christmas is supposed to be a time of family and joy and love and giving. While it was definitely the worst Christmas I've ever known, there were also moments of total joy and I'm extremely thankful for that. My kids are amazing and I'm so beyond blessed. So rather than focus on the difficulties, lets focus on the GOOD stuff. It's been quite a year. My daughter got married, my son has received 6 acceptance letters to universities and earned his Black Belt and finishing up with his Board of Review for Eagle Scout. We hosted my in-laws 50th wedding anniversary big bash party and hosted my daughter's bridal shower. 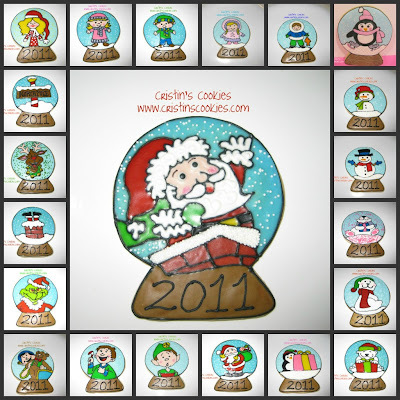 We've been extremely busy and during all that, in 2011 I started this cookie obsession/hobby. I still have LOTS of cookies to show you from Christmas, so hopefully you're not sick of Christmas just yet. 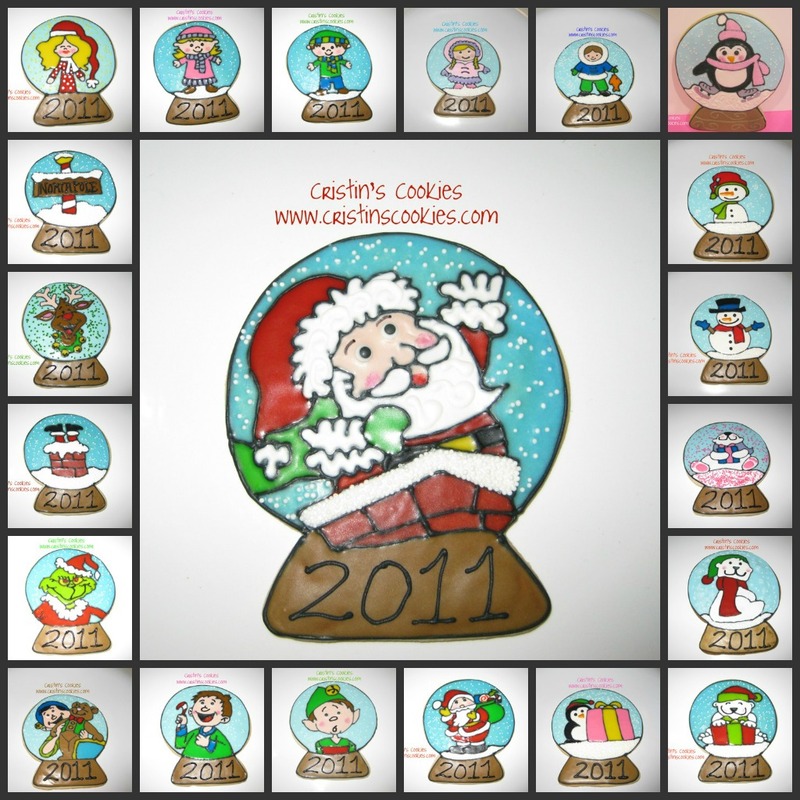 I made a whole bunch more snowglobes. I think this was my favorite cookie cutter this season. There are just so many possibilities with this one! My daughter and I found a Christmas coloring book at Target for $1 and I just felt compelled to make each of the pictures into a cookie! The snowglobes are fun huh! So which one is your very favorite? I hope you've all had a wonderful 2011 and I want to take this opportunity to thank you. Your comments lift me up and inspire me to continue to try to improve in my cookie decorating. I'm very thankful for you and all my cookie friends! Happy New Year. I hope this year is filled with lots of Joy and beautiful cookies. I LOVE snow globes. I think my favorite one is the elf one. Love his expressions. 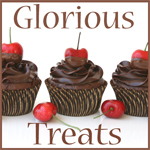 Can't wait to see all your beautiful cookies of 2012! I like them all but the polar bears are my favorite. Happy new year to you! 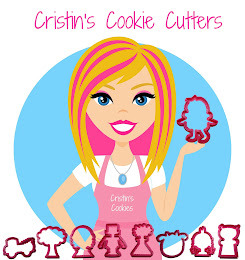 Cristin ~ all of your cookies shown are wonderful as always. I'm so sorry to hear that your Christmas was not all that you had hoped. I sincerely wish you all the best in 2012. You are a very strong, determined woman and whatever occurred on Christmas day I know that you will be able to cope with it and move forward. Thank you Karen! Merry Christmas to you too!